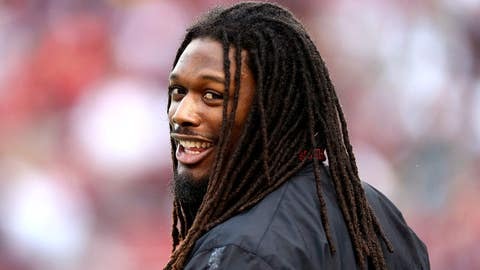 Jadeveon Clowney mostly mesmerized college football while wreaking havoc at South Carolina. With one game left in his college career, we’re no closer to an answer than we were when Clowney showed up at South Carolina. He was the Next Big Thing, and nobody can say the guy didn’t make an impression. Every football fan in America grew to know Clowney. Steve Spurrier joked that 1.4 billion Chinese recognized the unique name due to the hit – sorry, The Hit — he put on Michigan’s Vincent Smith in last year’s Outback Bowl. The sight of Vincent’s helmet flying off earned the play its own capitalized title, not to mention more than 6 million YouTube combined views. It set up Clowney as arguably the most hyped and definitely the most feared college football player going into this season. But instead of confirming his status as the NFL’s top prospect, Clowney is now a wild card. He went from a school-record 12 sacks as a sophomore to three as a junior. Teams ran away from him, and he had injuries. But Clowney also coasted and took himself out of the lineup minutes before the Kentucky game. He cited sore ribs, but skeptics wondered if the problem was more heart-related. Specifically, his ticker just isn’t that into football, at least the college kind. So what’s he going to tell NFL teams looking for a heartbeat? But is he mature enough to know the difference? Clowney’s always been such a freakish athlete, he hasn’t had to apply himself to make the highlight circuit. It’s as if God looked down on Feb. 14, 1993, and created the ultimate pass-rushing machine. He grew to be 6 feet 6 and 280 pounds, not counting the trademark dreadlocks. That potential is mesmerizing. But as Uncle Ben told Spiderman, with great power comes great responsibility. Just when you think Clowney is ready to fully accept his duties, he drives the other way. Fast. He was pulled over for going 110 mph a couple of weeks ago. That $445 ticket made such an impression, he was nailed last week for doing 84 mph in a 55 mph zone. He told state troopers he was rushing to catch the team plane to Orlando, where the Gamecocks will play Wisconsin in the Capital One Bowl. Again, he was joking. Clowney was a South Carolina folk hero before he got out of high school. He’s been handled with care and probably too much indulgence, state troopers excluded. He’s also perpetually smiling and easygoing. That makes him fun to be around, though NFL teams would just as soon their defensive ends be nasty and ruthless. So, what does the man who has almost everything give himself? The truth is, just getting to the Capital One Bowl is what he really wanted. Barring something disastrous on Wednesday, it means Clowney has made it through his NFL-mandated time in college. He did it without suffering the kind of injury that derailed ex-teammate Marcus Lattimore.